Democrats all over the Nebraska are running from US Senate to School Board, and they need your help. We are working hard to rebuild our Party with the grassroots at the table. We need everyone involved, from Scottsbluff to Omaha–rural towns and urban cities. Every candidate needs help with talking to voters at the doors and on the phones. The Nebraska Democratic Party (NDP) is launching a new Block Captain program that will transform our party’s operations. You can also donate money to help all Democrats. We win elections when grassroots Democrats are engaged in building the Party. 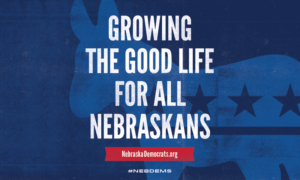 Let’s grow the good life for all Nebraskans! 1) Volunteer for a state or local campaign. Visit our Candidate page to check out all of the Democrats running for office in 2018. Just click on the links for the candidates and sign up to volunteer for the campaign. 2) Become a Block Captain. When you sign up on the Take It Back website, our local party gets your information and then an NDP staff member will be in touch on training and concrete tools to help you organize 50 houses around where you live. 3) Monthly donors help all candidates. When you become a monthly donor, not only do you get a free ticket to our annual Morrison Exon dinner, you also help all candidates on the Democratic ticket. 4) Make sure you are registered at your correct address. Our I Will Vote page helps explain all the deadlines for registering to vote and voting by mail. 5) Serve as a Party Leader. The Nebraska Democratic Party is made up of people just like you. Our State Central Committee governs the policies of the Party. We often have vacancies you can fill in your community including becoming a County Chair. 6) Attend local county meetings. Our Party is organized by each of the 93 counties in Nebraska. You can attend the local County Party meetings to learn who to get involved at the local level from delivering yard signs, to marching in parades and making calls for Democrats. 7) Get trained. We have training sessions you can view online. We also have in-person training programs for our Blue Bench Project. All Democrats can also sign up for a free training account with our partner the National Democratic Training Committee.